Lynkforce is a Raleigh, NC startup focused on connecting project-based work to high performing student consultants. We facilitate small business growth while providing students with relevant, impactful consulting experience. 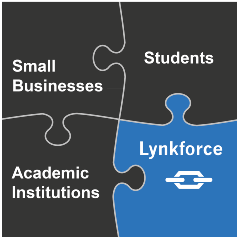 At Lynkforce, we believe small businesses, students, and academic institutions form the backbone of our communities. Strengthening the relationship between these groups is our number one priority. Still curious? We encourage you to continue exploring our site. Please send any further questions to info@Lynkforce.com.